I have a feeling that after the last couple weeks of inactivity around here, this post will not be much of an olive branch. I can almost hear your indignation: You don’t post for ages and now you’re telling me how to cook chickpeas!? I know, its a sad state of affairs, isn’t it? Despite me being legitimately busy over the past couple weeks (two terms of school down, one to go! ), you’d think I could come up with a recipe that’s more interesting that boil water; wait. Well, think again. As a vegetarian, beans and legumes make up a large part of my diet; I love them in curries and salads, and even with pasta. They’re cheap and nutritious and oh so tasty. Since the dried type is so much more affordable than canned, I try to buy them when I can. But like many, I’ve struggled with obtaining that perfect texture- my home-cooked beans often end up mushy and skinless, or else still chalky in the center after what seems like years of simmering. But no more, for I’ve hit on the perfect way to cook any type of dried bean to perfection. My trusted method is actually a mash-up of two, the Baking Soda Soak and the Oven Method. Both have their proponents and their skeptics, but I think together they make the perfect bean; the baking soda scrapes time off the simmering process, and the oven mimics the slow, pressure-cooked texture of canned beans. 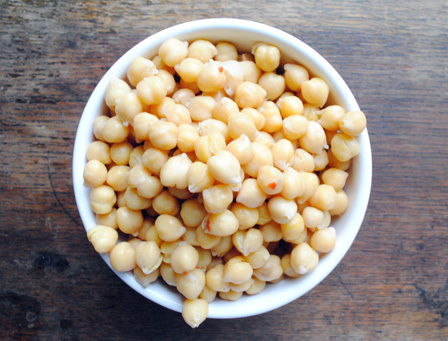 I’ve used chickpeas here (psst- I’ll be using these in some upcoming recipes, so I suggest a batch if you want to cook along), but this works with pretty much any kind of bean or legume. Place the beans in a large pot and cover with lots of cold water. In a small mug or bowl, whisk together the flour, baking soda and table salt with a splash of water until there are no lumps left. Stir this paste into the beans. Cover and let soak for 8 hours, or overnight. When the beans have soaked, preheat the oven to 175°C/350°F. Pour the beans into a colander and rinse well. Return to the pot and add your flavourings (if using) and the salt. Cover again with cold water and place over high heat on the stove. Bring to a boil and let cook for 10 minutes. 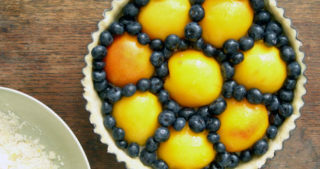 Then remove from heat, cover, and place in the preheated oven. Depending on the type of bean you’re cooking, begin to check for doneness after 45 minutes or so. I find that chickpeas take about an hour using this method. When your beans are done, rinse well and either use in a recipe or store in the fridge or freezer. Really interesting! I have always shied away from dried beans as I can never get them right. Could they be done in a slow cooker/crockpot? Thanks for this post ! 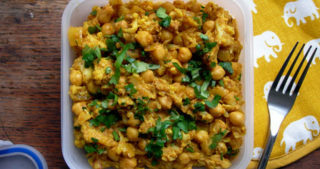 As a fellow veggie I absolutely love chickpeas but have yet to convince my boyfriend – perhaps your method will finally break him! I have never heard of either of those methods and I am totally intrigued! I too struggle with that perfect balance of mushy and chalky and can’t quite seem to get it right. I’m totally bookmarking this one. Thanks Ele! Ohh, I’ve never heard of doing them in the oven before… that would be quite handy if you also happened to be baking a loaf of bread or something. Also adding salt (or acid) at the beginning of cooking tends to keep them quite firm, but then the baking soda apparently counteracts that…so this would be really good to try. Thanks for this! Am also really getting into cooking my own beans, especially love adding bay leaves and garlic and/or onion to the cooking! That’s an interesting method, thanks for sharing. Just one question: what does the flour do?? Well I’ll definitely be giving this a try because I am constantly disappointment with the look of my white beans. If this is the trick, I’ll be very pleased! Thanks for sharing. I talked about my beans how-to in a post a while back, and while similar, I’m intrigued by several new techniques showcased here. I’m a fan of the Fannie Farmer method: boil 2 minutes, rest 1 hour, then add salt (+ baking soda for garbanzos) and simmer 1 1/2 to 3 hours until tender. I must try your recipe because obviously it works and those beans look perfect! 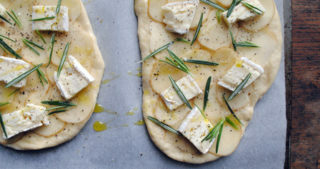 I’ve also never heard of the oven method and I’m really interested – if only to stop the kitchen steaming up and the house smelling of chickpeas (not always the most pleasant). Bicarb really helps but there is a huge debate about whether it strips out the vitamins. What’s your view? Claire- Yes! Apparently, a slow-cooker or crockpot is actually the best way to mimic the way commercially canned beans are prepared, and yields excellent results. I don’t own either so no recipe here, but do some Googling and I’m sure you’ll find something. Dana, Zo et al- I’d heard about the oven method for a long time before I tried it, and I can’t recommend it enough. It cooks the beans much more gently than simmering on the stove does, so they’re less likely to bounce around on each other and lose their skins. Also, it uses less water! Cristina- No idea whatsoever! The soda causes some sort of chemical reaction, but the jury is still out on the role of the flour. In any case, Anna del Conte says to use it, so I will until someone proves to me otherwise! 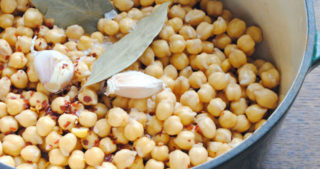 And once youv’e made the chickpeas a spicy chickpea soup is perfect with them – I use a Marcella Hazan recipe . The pasta combo sounds great also! 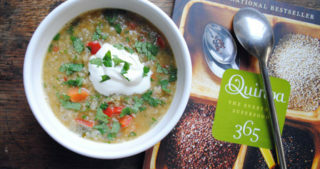 Oven-cooking is definitely the best way to make lentils. I once tried a baked beans recipe which started out with soaked but non-cooked beans, but it took like an hour longer than it was supposed to. Oh wow, I’ve never used a flour paste for soaking before (just baking soda generally). Any idea how the flour affects tenderness?